Now, it is time for us to say „Hello“ to the world because Inicat goes international! Well, Inicat has been accessible before to all people with an internet connection but since English is accepted as lingua franca, we had to give in and translate all these beautiful German words (or should I say “Genglish”?) for you guys, so that nobody is able to confuse the “publish music” button with the “delete” button anymore. 😉 Okay, that never really happened, what I am trying to say is: Inicat is very simple to use to spread, sell and/or free your music. Simple but powerful because of its very useful tools that enable you to promote your music project independently and to receive (monthly) financial support. 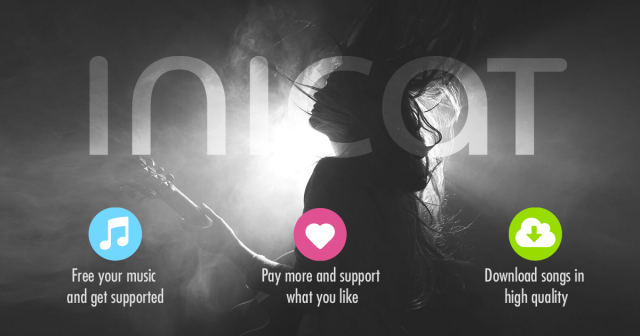 Since you may not be familiar with this DIY music platform and its opportunities for you as an artist (or as a fan to support your favorite artists), I will give you a short overview of Inicat’s features. You have read it correctly. It is your artist page that you create and administrate on Inicat. We “only” give you the tools to spread, sell and/or free your music for establishing a fan base that will hopefully support you and your projects regularly on a monthly a basis. We also help bands to spread their music (e.g. video and blog interviews), organize concerts with bands that use Inicat and record their shows for free (e.g. Inicat Session) or give away useful things to musicians with the help of our partners (e.g. free music video for the winner of the Inicat bandcontest). Of course, it would not help only you but also us as well if you choose your artist page on Inicat to be your “Go to”-site for downloading your music. The artist page is basically your own web page that is connected with several other self-administered artist pages. This is especially place where your Fans are able to support you financially on a regular basis or say “Thank you” for your content, and where you can free your music and even give your songs away for free to gain regular supporters for financing your project. Remember, fans are likely to download from pages where you link them to. We, who created Inicat and are artists ourselves, get only a small percentage of your earnings in comparison to other music platforms. This means, we don’t get any money from you unless you earn something on this platform. Sounds fair, doesn’t it? Now, I will quickly give you an overview of Inicat’s current tools to establish a fan base that supports you and your project regularly. Most of these tools follow the principles of giving and asking. People will be much more willing to support you if they realize that you are not just creating music to empty their pockets. Give away some or all of your songs for free and/or give them exclusive rewards for their regular support. Give away rewards to people that we would call Heartcore Supporters. Those people are your most supportive fans because they help you to keep your project financially stable. All content of artists is donatable, also within the news feed of a user. Furthermore, users who follow you will always receive your posts. There is no edge rank or other limitations of your outreach on Inicat. Fans can decide how much a song is worth to them financially. Choose round prices or give your songs away for free to make it more likeable that fans will give you more than you would have expected. Inicat’s slogan “Free your music” is there for a reason. We give you the opportunity to share as much of your music for free with your fans and the world as you want to. Whenever a user downloads your music or visits your artist page, they have the opportunity to follow you and to opt-in into your newsletter. You can contact people who opted-in directly via mail to send them news about you, invite them to shows or simply write with them. Again, your focus should not be along the line “How do I get the money from my fans into my pocket” if you really want to build a long-lasting fan base on Inicat or anywhere else that supports you not only financially. Think more about how you can make them want to support you and your project. By giving them something for free, people may also be more likely to give you something back when you ask them for it. If you are not registered yet, just go ahead and do so to check it out for yourself and get started!